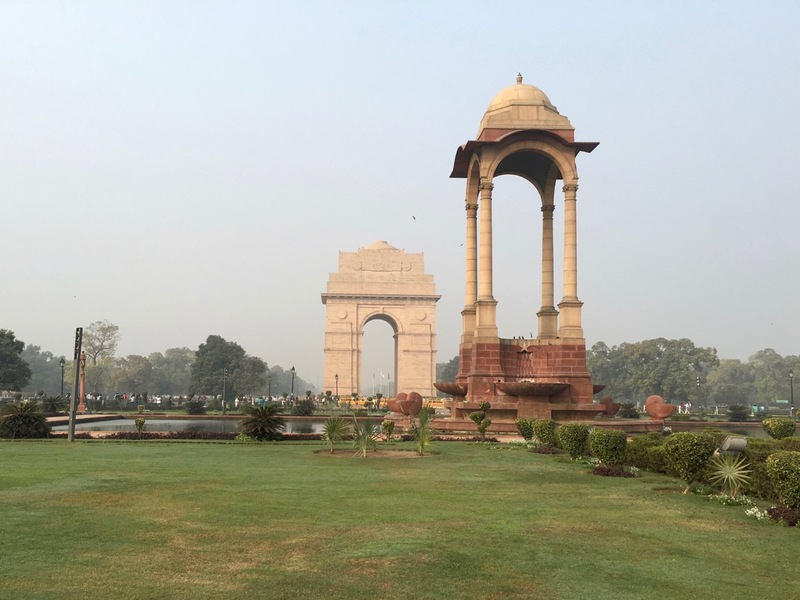 Let me tell you about the first full day in Delhi, where I had some experiences that would set the tone for much of the trip. I already wrote about the multi-day journey from Kansas City to Delhi. We finally got to bed at our Delhi hotel around 4:30am. The rest of that day was spent sleeping, resting, and just staying in the hotel. It’s a huge hotel, with several restaurants (all expensive) and lots to see. The first few nights we were in a room that cost about $200 a night, which is a ridiculous sum in India. But we didn’t pay because we got the hotel room for free due to Starwood points. On the second “day” was Tuesday December 1, and felt more like a real “day”. Using Google Maps, I determined our hotel was walking distance to one of the sights of New Delhi called the India Gate. So Beth and I started getting our things together to go there and check it out. But Beth had a little bit of a meltdown in the hotel, due to poor sleep, jet lag, and our baggage being lost. She decided to stay behind, and I set out walking solo. 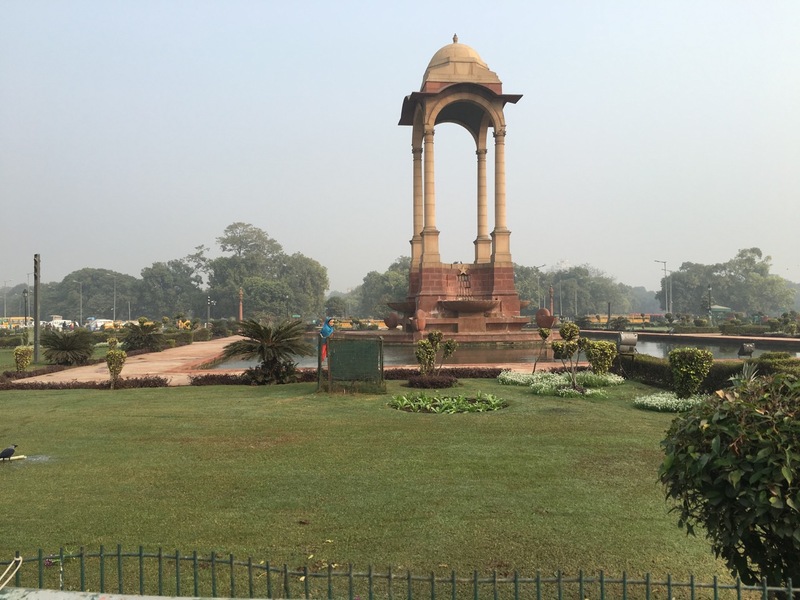 It felt good to get some exercise, and I headed down the street toward the big park where the India Gate is. After a “block” or so, another guy fell into step with me. He cheerily said, in good English, “Walking is so good for the health.” I smiled and replied something like, “Yes, I agree.” Then he asked what country I was from, and I told him. He told me about some friends he has in America. Ah, that’s nice. I wasn’t overly chatty, but was at least friendly. When he asked where I was walking, I said I’m going to the India Gate. “Oh, what protest?” I asked, still walking. “The farmers are protesting, and it may get violent. The police may use water cannons against them. It would be much better to go do some shopping first this morning, and then come back to India Gate in the afternoon. See, you can see the barricades up ahead.” He pointed to some weird metal structures that might be used as barricades but also might be bleachers for a parade or something. But there were no police cars, and no protesters. “Why are you still walking?” he asked. “No, that’s very dangerous. You should stop here,” he insisted. “It will not cost more than 20 rupees to get a tuk tuk to the shopping district.” About this time he gets a call on his mobile. I don’t hear or understand what he says. And then right at that exact moment, a tuk tuk pulls up and gets out. What a coincidence! The driver replied, “20 rupees”. “See?” said the guy who also likes walking for his health. “You go shopping now, and then go to India Gate later. “Maybe later,” I said and kept walking. At this point, the first guy continues to follow me, and the tuk tuk does a U turn to creep along beside me, driving the wrong way down the road. I just kept walking, crossed the street, and once I was in the big park — an area sort of like the National Mall in Washington, D.C. — I could see there were no protests, no police, no demonstrations. Just a few other tourists walking to the India Gate. It wasn’t closed, and the whole thing was a fabrication. I was on edge after that, wondering what other scam someone was going to try to pull on me, but once I got into the flow of the tourists, I felt better, safer. A few people came up to me to try to sell me stuff, but nobody tried to strike up a conversation, which is how I wanted it. The cross section of tourists there that morning was interesting. There were a few westerners like me, but there were also a lot of Indian tourists, and a surprisingly high number of Buddhist monks. The India Gate is India’s memorial to soldiers who died in the first World War. It was designed in a very European style by a European designer. Remember, India was still under British rule at that point. Nowadays there seems to be a sense of “well, that was the past, but now we’re going to do things the Indian way”. So I think if they designed the monument today, it would look very different. There were several armed guards around the Gate, and an eternal flame. Nearby, there’s a thing they call “the canopy” which was originally a canopy over a huge statue of King George V. But after India got its independence from Britain, they took down George and moved him to parts unknown. Now just his canopy remains. Some people think they should put a statue of Gandhi there now, but that hasn’t happened yet. Once I saw the sights and took my photos, a wave of jet lag fatigue was coming over me, so I headed back to the hotel. Several tuk tuks stopped to ask if I wanted a ride. When I said no, they all acted like they couldn’t understand why a person would actually walk somewhere. One of the drivers crept along behind me for about a block or so, asking non-stop “Where are you going? Do you want to go shopping? Good price tuk tuk. Where country are you from? Want to go shopping? Why are you walking? What hotel are you staying?” He went on and on like that for several minutes, until finally he nearly ran into a dog in the street and had to stop. About that time I guess he decided to give up the pursuit. After getting back to the room, I was exhausted, and napped. Beth felt better, and so we decided to go walk to find some lunch outside the hotel. There are no restaurants right around this huge hotel (probably on purpose, so you’re forced to eat there), but it was only about 1 km to an area where there were restaurants, according to Google. So we set out. This walk would be easier, because it’s just a straight shot north on a single street to get there. Along the way, about a half dozen tuk tuk drivers stopped to try to sell their services, half of them in the “very persistent” category that wouldn’t leave us alone even after we told them we’re only going nearby. Many would ask where we were going, and me, being polite, would answer. Sometimes I told the truth, but much of the time I lied. “We’re from Canada,” I would say. “We’re going to the barbecue restaurant,” when we really were not. But the funniest thing was a conversation with one guy who helpfully came up to us and had this conversation in fairly good English (I’m telling only one side, since you’ll get the gist of it). Sound familiar? Yeah, that was the second time in one day I got this one. Sigh. Have you ever seen the movie “Airplane”? Remember the airport fight scene? That’s how it feels to be an American walking through a touristy area of New Delhi. As I write this a couple weeks later, I want to point out that not all of India is that way. Here in a non-touristy area of Jaipur, I can walk down to the market and not a single person tries to scam me or offer me an unwanted tuk tuk ride. For more on the scams of Delhi, see here. Actually, just google “touts scams delhi” and you’ll get an encyclopedia of experiences and counter-ploys. All part of life’s rich Tapestry in the land of Gold and Silver, Rice and Curry. Great blog Todd.